No matter how much good an energy bar does for you if it doesn't taste good you won't eat it. (Broccoli anyone?) Honey Stinger knows it. Lance Armstrong knows it. Lexco knows it. 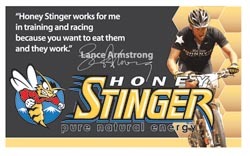 Says Armstrong: "I first tried Honey Stinger products during a mountain bike race in Colorado. I was impressed with the great taste and energy they provided. Honey Stinger works for me in training and racing because you want to eat them and they work." Honey Stinger was formed by an eclectic group of people: an athletic entrepreneur, a honey industry veteran, a food product developer and a beekeeper. The combination of experience has developed a host of all-natural, good-for-you, mostly organic products which feature nature's natural sweetener - honey. Honey Stinger Energy Bars - feature the natural goodness of honey, 23 vitamins and minerals, 20% recommended allowance of protein, plus calcium and antioxidants. The bars come in four flavors: Apple Cinnamon, Berry Banana Buzz, Rocket Chocolate and Peanut Butter 'N Honey. Honey Stinger Energy Bars are an "Editor's Pick" of American TRI magazine. Protein Bars - A meal replacement snack or after-workout recovery bar. Each bar is gluten free and contains no trans fat. Consists of 30% USDA organic-certified honey, whey protein, 22 vitamins and minerals, calcium, and antioxidants. Comes in both 10g and 20g protein bars, and three flavors: Peanut Butta, Dark Chocolate Coconut Almond, Dark Chocolate Cherry Almond. Organic Energy Chews - Great for when you're on-the-go and need just that little bit extra. Gluten, dairy and fat free. Twelve chews per bag. Flavors include: Fruit Smoothie, Cherry Blossom and Pomegranate Passion Fruit. A 2009 "Editors' Choice" award from Backpacker magazine. "The aspect of Honey Stinger that WOW'd me was the taste of the bars," says Karen Peterson of Lexco . "They taste a little like the Three Musketeers bar, but the Honey Stinger bars are good for you. I found all of the flavors exceptionally delicious." "Partnering with Lexco is exciting for us. They have a loyal following, a great reputation, and they are based in Chicago which is a key market for us," Says Adam Spector, Sales Manager for Honey Stinger. For more information about Honey Stinger and Lexco or to get the new Lexco 2010 product catalog, contact Lexco at (800) 626-6556, or e-mail sales@lexcobike.com.